Apple today filed six new Apple Watch model numbers with the Eurasian Economic Commission, including A1977, A1978, A1975, A1976, A2007, and A2008, according to French blog Consomac. All of the models run watchOS 5. These model numbers likely correspond with the widely rumored Apple Watch Series 4 lineup, expected to be unveiled at an Apple Event in September alongside a trio of new iPhone models, new AirPods, and more. In the past, similar filings with the Eurasian Economic Commission have been submitted for the lower-cost 9.7-inch iPad, 10.5-inch iPad Pro and 12.9-inch iPad Pro, iPhone 7 and iPhone 7 Plus, Apple Watch Series 2, AirPods, and 2018 MacBook Pro with Touch Bar, usually within one to two weeks before each product was released. At this point, it was already pretty obvious that Series 4 models are coming next month, but the filings eliminate any remaining doubt. 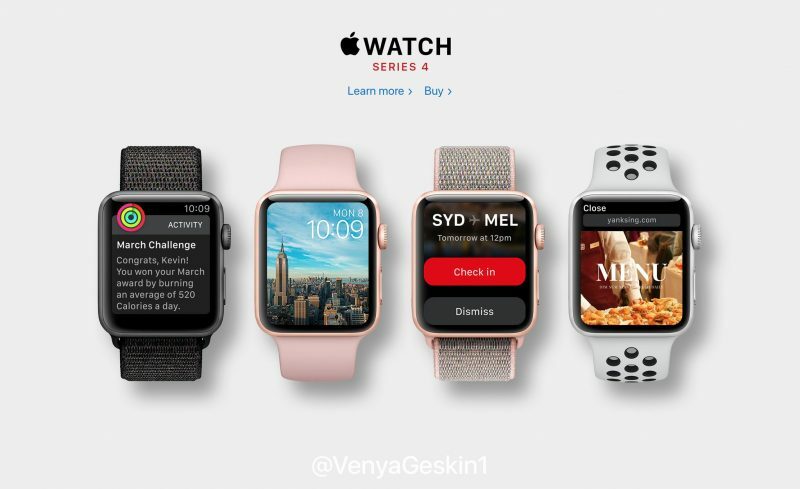 The only unique aspect of this year's filings are that there are currently only six unreleased Apple Watch Series 4 model numbers, whereas the Series 3 lineup has eight model numbers: two aluminum GPS-only models, and six LTE models, including aluminum, stainless steel, and ceramic variants in two sizes. Naturally, this has led to some speculation that there might not be ceramic Series 4 models, but there are many possibilities. Earlier this year, well-connected Apple analyst Ming-Chi Kuo said Apple Watch Series 4 models will feature 15 percent larger displays, longer battery life, and improved health monitoring capabilities. If past is predicate for the future, Apple will likely hold its next event on Wednesday, September 12, with invites to the media going out in the last few days of August. MacRumors will provide live coverage as usual.